Camden Silo Creek is located around a nature preserve in the Broadlands subdivision of Ashburn, Virginia, where our residents have convenient access to Loudoun County Parkway and the Dulles Greenway. Just a few miles from your apartment you’ll enjoy great shopping and unique dining options at One Loudoun – Loudoun County’s New Downtown, Lansdowne Town Center, Leesburg Premium Outlets and Dulles Town Center Mall. Each one, two and three bedroom apartment home offers luxury finishes such as custom espresso cabinetry, quartz countertops, glass tile backsplash, wood-style plank flooring, stainless steel appliances, LED lighting and full-size washer and dryer. These Ashburn apartment homes also feature intricate details such as 9-foot ceilings with architectural arches and crown molding, built-in bookshelves, computer desks, bay windows, fireplaces and wraparound balconies with breathtaking views in a picturesque park-like setting. Select apartment homes even feature attached single car parking garages. Residents receive a technology package included in the total monthly rent with a savings of up to 47% off retail. This money-saving package includes high-speed internet up to 150 Mbps and over 140 digital video channels through Xfinity. Use the Xfinity Go app on your smartphone or tablet to access your digital video anywhere! 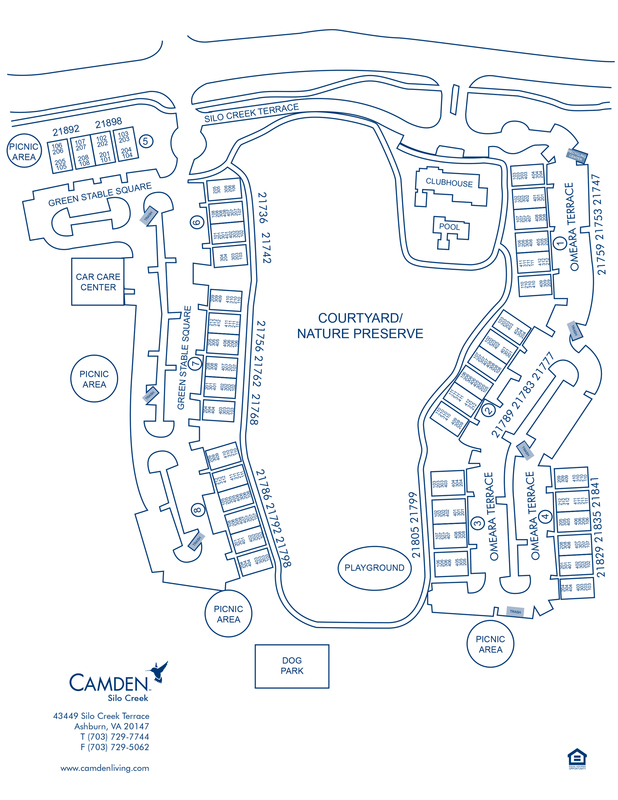 Camden Silo Creek offers incredible amenities like resort-style pools with sundeck and grilling area, expansive fitness center with towel service, walking trail throughout the community with exercise stations, business center with printer and scanner, playground and gated Dog Park. Camden is all about living green so take advantage of at-your-door trash and recycling pick up. Just five minutes from three different parks, Camden Silo Creek also puts you close to great shopping, dining, and entertainment. What more could you want in your home? Make Camden Silo Creek your home today! At Camden, your pets are family too! We welcome cats and dogs, up to two pets per apartment home. Call us with any pet-related questions! Pet Fee: $400 per pet (non-refundable) Pet Rent: $50 monthly per pet Restricted breeds: American Pit Bull Terrier, American Staffordshire Terrier, Staffordshire Bull Terrier, any mix of the previous breeds, or any other dog or breed deemed aggressive. Get the perfect spot! We have ample open parking for our residents and Visitors on a first-come, first-served basis. Visitors may obtain a temporary parking permit from the leasing office and park inside the gates of the community. Detached Garages are available to rent for $175 per month. Select apartment homes include Attached Garages! Call us for details.